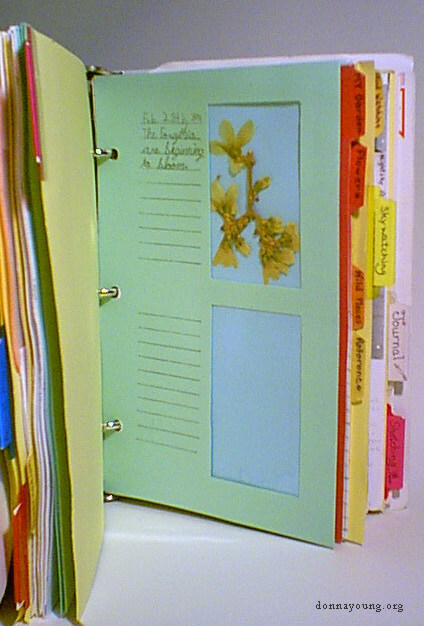 The specimen holder shown here contains a pressed forsythia and my daughter's best handwriting at the time. The specimen page pictured here is a sandwich of those materials. The green outer paper is folded in half. Cut a piece of white paper in half. Cut windows in the white paper that is in the same place as the green paper - BUT cut the windows around 1/4 inch or more larger. The blue insert serves an important function. They hold the specimens in place. Mount the specimen on the blue paper with white glue. For large specimens, use a photo sleeve that is for 5 x 7 photos. The specimens for this book can not be larger than the pages unless the specimen is broken and mounted on a fold-out page. This specimen page uses the two lower pockets from a photo sheet. 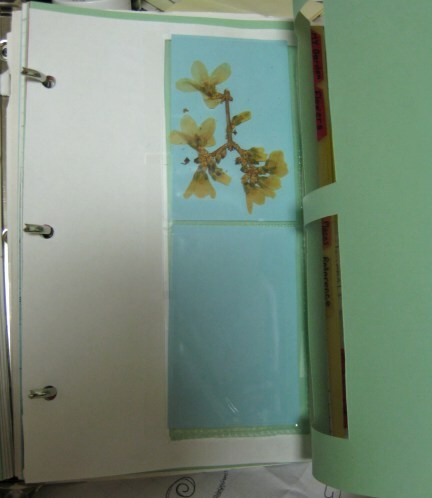 See Nature Journal Specimen Page - Leaves for information about the photo sheet. In this image you can see the white paper with the photo album sleeeves taped to it.